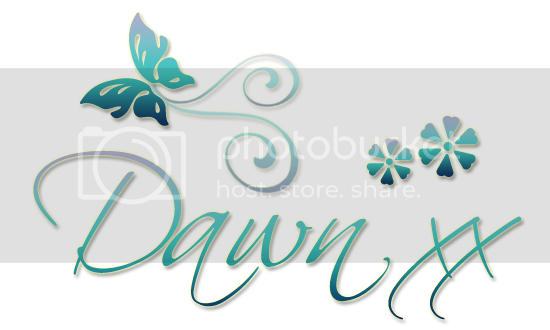 Dawn's Crafting: 80 Years Young! Good morning all! Hope you are all well! ( I must apologise for not being up to date on my blog commments. who celebrated his 80th birthday yesterday! The card base is 8"x8" I do enjoy working with this size of card! The papers are from my minds eye. The fantastic image is from Marilyn from Ike's Art. I've used her several times now! I coloured her lightly with flexmarkers the cut out with a Spellbinders circle die! I used the layout from Paper Play Sketches & would like to enter their challenge! as stencils. I used a bit of Kraft CS for matting & layering! The fish tails were created using a square punch. The sentiment button was done in my graphics programme. If anyone would like it, please just ask! for men, as long as it's not too flowery or sparkly! DRS Designs - Include The Word "Day"
A great card. I'm sure your father must have loved it. You put so much thought about his likes into it. Love Marilyn and love how you donn your card!! Sorry to hear you have been under the weather this week. A beautiful card you created for your Dad! Happy Birthday wishes winging their way to him! What a fun card and card design! gorgeous Dawn and also the papers. What a fabulous card Dawn and sounds like Dad will LOVE it since it encompasses some of his favorites! Great job! Happy Birthday to Dad! My mom was 86 in January and Dad has been gone some 27 years ... time sure flies ... treasure your time with him! Thanks so much for joining us at The Sisterhood’s ‘BIRTHDAY’ challenge and please come back again soon! hurry send mail to Kylie..
Oh I bet your dad loved this card Dawn. Sorry to here your a bit under the weather just now. I hope you fell better now. Special card full of nostalgia and inspiration, a great card. Best wishes to your Dad 80's Birthday and for many years more. A gorgeous card Dawn, fabulous papers and great take on the sketch. Sorry to hear that you have been under the weather, I hope you are feeling better now. Happy Birthday to your dad. Bet he loves this. Thanks for playing along with us at Seize the Birthday! The colors and design of you card! Happy 80th to your Dad and I hope you start feeling better! Thanks for sharing with us at Cards in Envy. Wishing a happy 80th birthday to your dad. He is going to love your Marilyn card. Thanks for playing along with us at Seize the Birthday. Hi Dawn, A fabulous card, with gorgeous colours. Hope your dad had a lovely birthday and hope you feel better soon. Have a lovely weekend. What a beautiful card! Happy belated birthday to your Dad! Fab card, my friend, and a Happy Birthday wish to your dad, too. Loving the paper choices and the simple way you added ribbon and lace. Exquisite design! The card is awesome and i am sure your dad loved it. What a beautiful image, and I love the teal and green combination! Thanks so much for playing with us this week at The Challenge! Some Gorgeous Color on this Dawn! What a fab card for your friend - you captured some meaningful things for her and I really like how this looks. 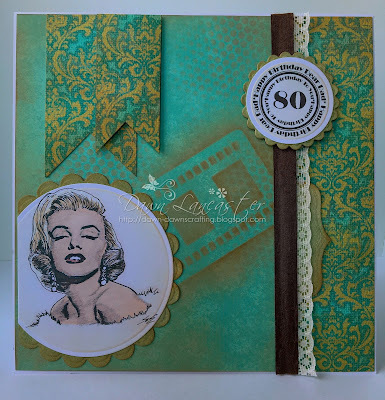 Thanks for sharing this with us in the DRS Designs Challenge. Hugz - big ones! Gorgeous card for your Dad. Hope your Day enjoyed his Birthday. Thank you for joining us at crafty sentiments. such a pretty card, I love the colors!!!! thanks for playing with Cards in Envy!!! A fabulous theme for your card, love the image and great papers. Great card. Thanks for joining the DRS designs challenge. Sorry to hear you've been poorly Dawn, hope you feel better soon!....This is a fab card for your Dad and wow 80years young!! Back again, with my DT hat on...lol Still a fab card and thanks so much for sharing it with us at Crafty Addicts!